Host a Pinwheel Garden for Child Abuse Prevention! Host a Pinwheel Garden for Child Abuse Prevention! A pinch of prevention is worth a pound of cure! Children raised in supportive, safe, and non-biased environments are not only more likely to succeed academically, but they also have the strongest chance at a socially and economically stable future. Investments in healthy childhood development though access to healthcare, housing, food security, and child abuse prevention polity promote solid future for all communities. Prevent Child Abuse Virginia asks that you show your pledge to make prevention a priority by joining their Pinwheels For Prevention Campaign for the month of April. With the help of Greater Richmond SCAN you can become a 2018 Pinwheel Partner by planting a Pinwheel Garden, placing an Abes for Babes container at your place of business, conducting a snack drive, hosting a Blue Day event, inviting SCAN to talk to your staff members, or sponsoring a free Stewards of Children Training. For more information, please contact Katelynn Jarrells of SCAN. We’d like to lead by example by partnering with the RRPDC to plant a small Pinwheel Garden on April 2nd at our offices. 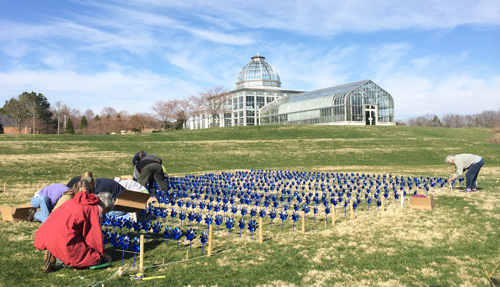 If you’d like to see a big Pinwheel Garden in effect, you won’t want to miss Lewis Ginter’s display representing the 3,000 children served by Prevent Child Abuse Virginia’s Healthy Families Program.